Thank you for your interest in helping Villa with our advocacy efforts! For more information about our current advocacy campaign, how to advocate, or to find please scroll down or click on the links in the green navigation bar above. 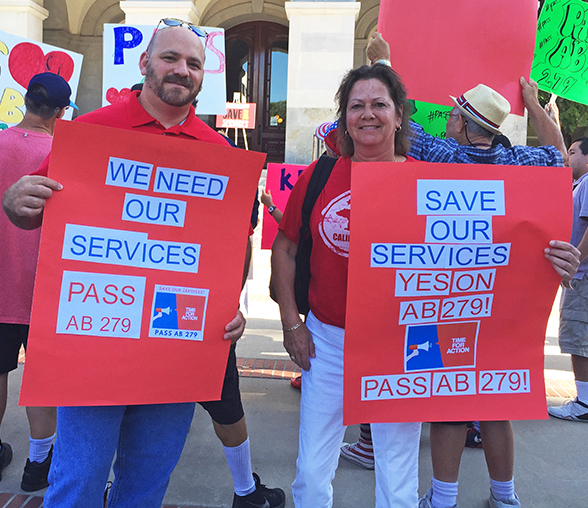 Villa's CEO, Kelly White, and Vice President of Adult Programs, Aaron Kitzman, attend the AB279 rally in Sacramento. Step 1: Find your legislators by scrolling down or by using the Find Your Rep website. Step 2: Download the sample letter by clicking here. Step 3: Fill in the letter with your information. Step 4: Send the letter to your legislator via mail, fax, or email. 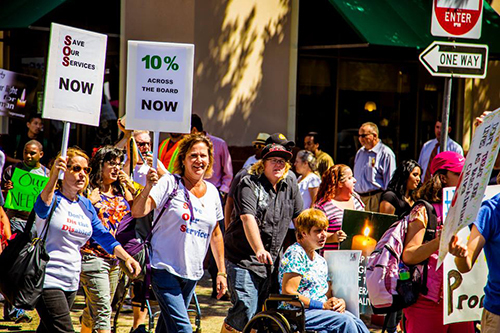 California's lawmakers must fund the services and supports which people with intellectual and developmental disabilities rely on to live fulfilling lives. 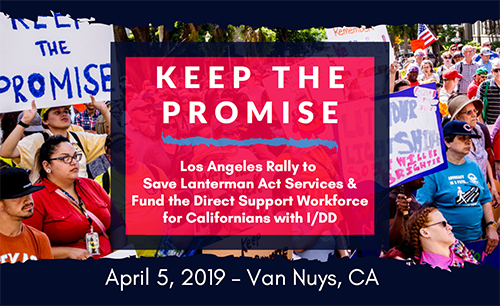 Join the Lanterman Coalition, as well as clients and their families, in Van Nuys on April 5, 2019 to demand that our lawmakers #KeepThePromise to the I/DD community. Activities: March around State Offices (bring signs and wear comfortable shoes), sign letters to legislators, listen to speakers. Once again, California service providers for individuals with intellectual/developmental disabilities (I/DD) are facing a crisis. More than 330,000 Californians with I/DD live in our state; they are our neighbors, classmates, coworkers, family, and friends. However, their support structure has been grossly underfunded and is failing. Reimbursement rates have not increased in 20 years. Direct support staff are quitting the field or working multiple jobs due to low wages, essential programs are closing throughout the state, and individuals with I/DD are forced to live with inadequate supports or without supports at all. These vital services are in jeopardy due to the severe financial constraints under which Villa and other service providers are forced to operate. California’s lawmakers must fund the services and supports that people with I/DD rely on to access their civil rights. An 8% rate increase will provide the emergency stabilization that our community desperately needs. Additionally, for the first time in 25 years, the State has hired consultants to take a hard look at how much the State should support critical services for individuals with I/DD. A draft of the Rate Study as mandated by ABX2-1 was published on March 15th by the Department of Developmental Services. It is critical that all stakeholders have an opportunity to fully vet all key assumptions in this study. We must discuss where and how these assumptions will lead to unintended, negative, and potentially disastrous consequences and then, agree on how we can work together to modify these key assumptions. Villa has a desire to advocate for and protect those that cannot speak for themselves in the intellectual/developmental disabilities (I/DD) community. As part of a coalition of 16 Southern California non-profits dedicated to increasing awareness and educating both local and state legislators, friends and families on the importance of continued funding, Villa works tirelessly with these and other local service providers to make our voice heard. We have been extremely active in our advocacy efforts - we contact legislators through emails, phone calls, faxes, and handwritten letters; we arrange meetings with legislators locally and in Sacramento; and we attend hearings and rallies in Sacramento. Villa's goal is to help protect services for children and adults with intellecual/developmental disabilites including autism, Down syndrome and cerebral palsy. As issues which affect our community come to light, we often request specific support from our base to help us with email or letter writing campaigns. If you would like more information on how to become an advocate in your community, please email info@villaesperanzaservices.org. To stay up to date with Villa's advocacy efforts, please join our email list and check out our Facebook page. Villa's CEO, Kelly White, and previous Villa family member, Margaret Morris, march in a Lanterman Coalition Rally. Otherwise, please reference the list of current southern California legislators below which cover both areas that Villa serves - the greater Pasadena area and the San Fernando Valley area, which includes Thousand Oaks and Westlake Village. Governor of the state of California. Click Here to Contact Governor Newsom Now! Includes all or parts of the cities of Altadena, Burbank, Glendale, La Canada Flintridge, Monrovia, Pasadena, South Pasadena, and San Marino. Click Here to Contact Senator Portantino Now! Includes all or parts of the cities of Los Angeles, Alhambra, East Los Angeles, San Marino, and South Pasadena. Click Here to Contact Senator Rubio Now! Includes all or parts of the cities of East Los Angeles, Monterey Park, Rosemead, El Monte, Irwindale, Baldwin Park, West Covina, and Azusa. Click Here to Contact Senator Durazo Now! Includes all or parts of the cities of Alhambra, El Monte, Monterey Park, Rosemead, San Gabriel, San Marino and South El Monte. Click Here to Contact Assemblymember Chau Now! Includes all or parts of the cities of Altadena, Arcadia, La Canada, La Crescenta-Montrose, Pasadena and South Pasadena. Click Here to Contact Assemblymember Holden Now! Includes all or parts of the cities of Duarte, Baldwin Park, El Monte, West Covina, Covina, Azusa and Glendora. Click Here to Contact Assemblymember Rubio Now! Click Here to Contact Senator Stern Now! Includes all or part of the cities Thousand Oaks, Simi Valley, Moorpark, Camarillo, Ventura, and Ojai. Click Here to Contact Senator Jackson Now! Includes all or part of the cities of Camarillo, Moorpark, Oak Park, Oxnard, Santa Rosa Valley, Thousand Oaks, and Westlake Village. Click Here to Contact Assemblymember Irwin Now! Click Here to Contact Assemblymember Gabriel Now! Includes all or part of the cities of Van Nuys, Valley Village, Sherman Oaks, Panorama City, and North Hills. Click Here to Contact Assemblymember Nazarian Now!